Gidel, a technology specialist in cutting-edge Vision and Imaging solutions based on FPGAs, today announced the formal launch of InfiniVision, an innovative, customizable, FPGA-based framework. InfiniVision provides an all-encompassing solution to the fundamental challenges posed by multi-camera/sensor and multi-processing Vision systems by taking advantage of the reconfigurable nature of FPGAs and their inherent capability to perform ultrahigh-speed parallel processing. The InfiniVision system was developed to provide a powerful and flexible framework that addresses the core challenges of a multi-camera, multi-sensor system — mainly the capacity for high speed acquisition, synchronization, real-time image processing, and efficient data storage, recording, and playback. InfiniVision is outstanding in its flexibility to customize the camera interface, acquisition flow, and data offloading. 1. Ready-to-use multi-camera frame grabbing and image processing flow with an offload engine to the host computer. This first level provides the foundation infrastructure to quickly set up the basic acquisition flow. 2. Gidel field-tested ISPs and data control IP blocks. This second level provides building blocks for implementing immediate functionality such as compression and encryption. 3. Customization of interface, protocol, data flow, and image processing. This third level provides the ability to tailor the system by adding user ISP or other blocks, customizing the acquisition and processing flow, customizing data transmission protocol, etc. The entire development flow is supported by Gidel’s ProcDev Kit development application, which is designed to facilitate and accelerate development on FPGAs. The ProcDev Kit application is simple and intuitive, automatically generating the FPGA envelope code and the interface to the host computer. ProcDev Kit also generates the software driver for the user’s application. InfiniVision is the byproduct of Gidel’s vast experience in both FPGA technology and implementation of Vision and Imaging algorithms. The InfiniVision concept incorporates years of valuable accumulated knowledge that has been derived from intimate collaboration with Gidel’s many Vision clients. The InfiniVision framework offers abundant, powerful, and ready-to-use infrastructure, as well as virtually unlimited flexibility supported by efficient development tools. 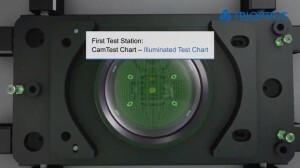 InfiniVision thus ensures a quick start on multi-camera/sensor development tasks and an accelerated development cycle. By virtue of utilizing InfiniVision, Gidel’s partners have managed to complete their system development within just a few months, compared to more than a year’s time initially allocated for such a project. Visit Gidel at stand 1|11 at VISION in Stuttgart, Germany from 6–8 November for a demo of InfiniVision with both lossless and lossy compression.